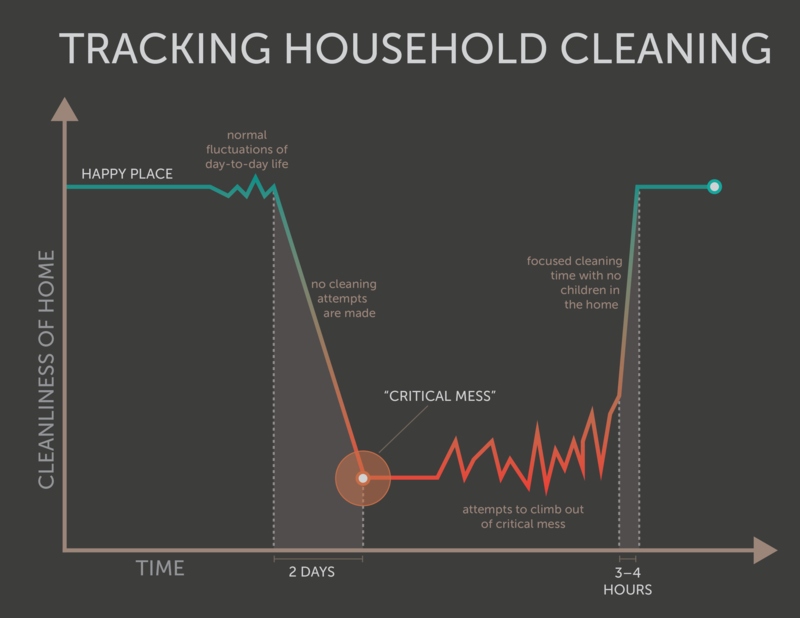 Today I decided to graph out the cleaning cycle that usually takes place in our home. As evidenced above, there is a happy place – a level of cleanliness that makes me feel in control, happy, and on top of life. I like things pretty clean, so the happy place includes minimal clutter, clean floors, no piled-up laundry, and beds made. In general. You’ll notice that normal fluctuations happen – laundry piles happen, the floor gets sticky, some clutter builds up. Sometimes we even play with a box of Cheerios and a bunch of cups and bowls on the living room floor. That can make a pretty big mess. But all of that, if checked within a day, is just part of normal life with two young kids. It’s relatively easy to get back on top of things. However, if a period of two days passes with no cleaning attempts made, either if life is busy or someone is sick or things just get a little out of hand, we soon reach what we call “critical mess.” This state is characterized by clutter piled up on the counters, cantaloupe chunks under the kitchen table, dirty dishes filling (and spilling over) the sink, laundry piles on beds and/or floors, and legos taking up any otherwise clean carpet space. It takes a period of 3 to 4 hours of me alone in the house blasting my cleaning music to get us back to my happy place. But I don’t always get 3 to 4 hours alone in the house right away. Sometimes we have to hang out in critical mess for a while. During this time, we can make attempts to climb out – the dishes can finally get done, the living room floor can get cleaned up, we might even be able to vacuum a room. But without those 3 to 4 hours, we’ll eventually fall back into critical mess. It should also be stated that these little attempts to climb out of critical mess are mentally very difficult and require a lot of psyching myself up. Periods of procrastination by doing things like reading, writing blog posts, or designing useless infographics are common. Guess which state my house is in right now?